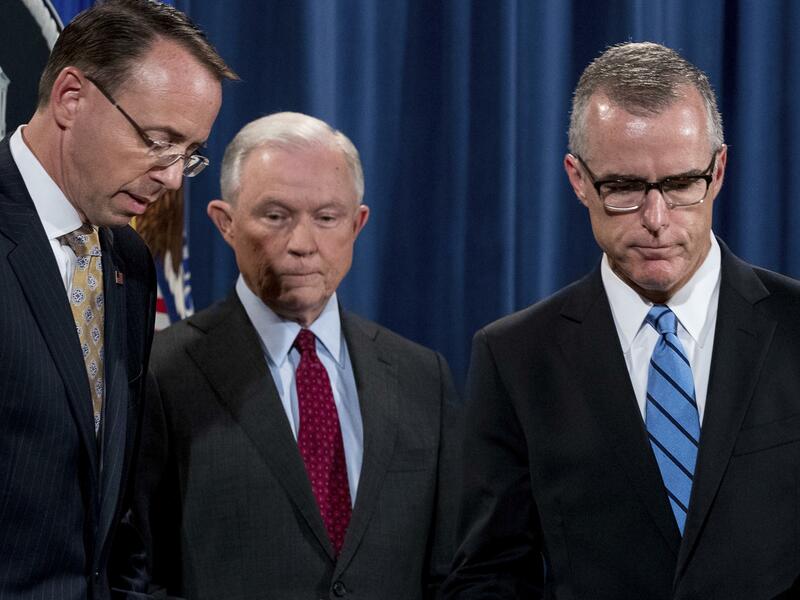 Deputy Attorney General Rod Rosenstein (from left), Attorney General Jeff Sessions and onetime acting FBI Director Andrew McCabe have all been political targets of President Trump's. He continued: "I will not further comment on a story based on anonymous sources who are obviously biased against the department and are advancing their own personal agenda. But let me be clear about this: Based on my personal dealings with the president, there is no basis to invoke the 25th Amendment." That amendment deals with presidential succession. Other reports on Friday suggested that Rosenstein had discussed wearing a wire to talk with the president — but that he was being sarcastic or facetious. In a second statement released by the Justice Department Friday night, Rosenstein specifically addressed those suggestions and again touched on the reporting about the 25th Amendment. "I never pursued or authorized recording the President and any suggestion that I have ever advocated for the removal of the President is absolutely false," the deputy attorney general said. A New York Times story cites, among other reporting, memorandums by former FBI Deputy Director Andrew McCabe about his dealings with the White House and other Justice Department officials. An attorney for McCabe acknowledged on Friday that McCabe did write memos, but that he had given them to special counsel Robert Mueller and doesn't know how The New York Times may have gotten them. "Andrew McCabe drafted memos to memorialize significant discussions he had with high-level officials and preserved them so he would have an accurate, contemporaneous record of those discussions," said his lawyer, Michael Bromwich. "He has no knowledge of how any member of the media obtained those memos." The report about Rosenstein follows months of ill will involving Trump, his Republican supporters and the leadership of the Justice Department. Trump said earlier this week, "I don't have an attorney general," underscoring his deep antipathy toward Attorney General Jeff Sessions. Rosenstein also has been a political target for his role in appointing Mueller and for signing an application for surveillance of Carter Page, a former foreign policy adviser to Trump's 2016 campaign. Republican antagonists in the House also have targeted Rosenstein as they have tried to investigate the Justice Department's probe into the Russian attack on the 2016 election. House Judiciary Committee Chairman Bob Goodlatte, R-Va.; House intelligence committee Chairman Devin Nunes, R-Calif.; and others have scourged Rosenstein over what they call his foot-dragging in producing documents related to the early phases of the probe. The FBI and Justice Department leaders also have been censured from within. McCabe was fired after an internal investigation found he "lacked candor" in terms of dealing with investigators. Former FBI Director James Comey — fired by Trump — was upbraided by a huge internal report for his handling of the Hillary Clinton email investigation. Others — a former special agent, Peter Strzok, and a former FBI lawyer, Lisa Page — embarrassed the bureau when internal investigators discovered they had sent each other scores of highly political text messages, including some that criticized Trump. Trump and his Republican allies say the Russian investigation is the product of "biased" conspirators deep within federal law enforcement and have picked away at a number of targets at all levels. Trump's son Donald Trump Jr. picked up that theme on Friday in a Twitter post that grouped Rosenstein with those who, in his view, are out to get the president. Supporters of the Mueller investigation said the Times report shouldn't be a casus belli for Trump to fire Rosenstein — as some have called for him to do — or to otherwise try to disrupt Mueller's work. "This story must not be used as a pretext for the corrupt purpose of firing Deputy Attorney General Rosenstein in order install an official who will allow the president to interfere with the special counsel's investigation," said Senate Minority Leader Chuck Schumer. The Times story focused on the early part of Rosenstein's tenure in the Justice Department leadership. Trump had just fired Comey based partly on a rationale that Rosenstein had agreed to develop, which the Times said Rosenstein found jarring. The former U.S. attorney felt as though he had been used, the newspaper reported. As Trump searched for a replacement, Rosenstein discussed the idea of FBI officials going to meet him secretly recording their interactions, according to the Times. McCabe may have memorialized those discussions in his memos, which followed the series of memos Comey also had written since his first meeting with Trump. One question now is whether McCabe's account reflected whether Rosenstein might have been joking — or whether the people who have given McCabe's account to the Times reflected his inflection accurately. Comey has said that he was so unsettled by his first encounter with Trump — because of a fear that Trump might later lie about their conversations — that he felt compelled to begin writing down accounts each time they talked. McCabe, who succeeded Comey as acting FBI director in May 2017, evidently did the same. Both men had bad relationships with Trump. In McCabe's case, he had been the subject of criticism by Trump and Republicans for months over his wife's political connections with Democrats in Virginia, where she had unsuccessfully sought state political office. Comey's own memos recount him defending McCabe to Trump and trying to assure the president that McCabe could be professional and continue to serve in the leadership of the bureau even after the political attacks of the 2016 campaign. McCabe's memos are likely to form part of his book about his time at the FBI, which is scheduled to be published in December. Trump denies the account of events that Comey has given in his memos and to Congress, including Comey's description of Trump asking him for his loyalty and to ease up on then-national security adviser Mike Flynn. Those descriptions, as well as whatever other evidence has been gathered by Mueller, could be part of a potential future obstruction of justice case against Trump. And now we're joined by NPR national justice correspondent Carrie Johnson. Hi, Carrie. SHAPIRO: You followed Rosenstein for years since he was the U.S. attorney in Baltimore. Is this account in character for him? JOHNSON: Well, he's really not known as being a brazen or a mercurial guy. It's true he was very shaken after the firing of FBI director Jim Comey last year. That's when his memo criticizing Comey was cited as a justification by the White House. Rosenstein pushed back on that at the time. Remember, the president went on to tell NBC News he fired Comey because of the Russia thing. Now that whole episode is a central part of the ongoing special counsel inquiry. And of course, Rod Rosenstein is the one who appointed the special counsel last year. SHAPIRO: I know you've been speaking with people close to Rosenstein today. What are you hearing? JOHNSON: Yeah. I got hold of a guy named Jim Trusty, former prosecutor, who's known Rod Rosenstein for 15 years. Here's his reaction. JIM TRUSTY: I can't imagine a circumstance where he seriously suggested wearing a wire in dealing with the president. JOHNSON: Indeed, one person in the room for the conversation reported by The Times is telling reporters Rosenstein made that remark, but it was sarcastic, that it was like a dark joke or black humor. Preet Bharara, the U.S. attorney in New York - former U.S. attorney in New York, tweeted that jokes about wiring people up in prosecutor circles are as common as knock knock jokes. And as for stirring up conversation about the 25th Amendment, Jim Trusty says Rod Rosenstein's a good lawyer who once wanted to be a judge. The 25th Amendment is reserved for cases where the president is totally incapacitated, Jim Trusty says. TRUSTY: And I also don't doubt for a moment that Rod knows that whatever you think of President Trump, we're nowhere close to a situation where you can legitimately suggest the 25th Amendment's going to kick in. SHAPIRO: And what has the reaction been from people close to the White House? JOHNSON: Ari, it's been fast and furious. The president's son, Donald Trump Jr., tweeted almost immediately after this Time story came out that he was shocked - oh, who are we kidding at this point, Jr. said. No one is shocked that these guys would do anything in their power to undermine Donald Trump. And Laura Ingraham, the Fox News host who was mentioned for several top White House jobs last year, tweeted that Rod Rosenstein must be fired today. Congressman Jim Jordan, a close ally of President Trump, is demanding to see some of these memos described in The Times story and other documents so we can judge for ourselves. Now, Democrats in - on Capitol Hill have a very different reaction. Chuck Schumer, the top Democrat in the Senate, says this story must not be used as a pretext for the corrupt purpose of firing Rod Rosenstein and installing an official who'll allow the president to interfere in the special counsel probe. SHAPIRO: What would happen if Rosenstein, who oversees the special counsel probe, were fired? JOHNSON: This would be the disaster scenario that so many Democrats and even some Republicans in Congress have been warning about for months. Remember, the Senate Majority Leader Mitch McConnell was imploring the president to wait to get rid of Attorney General Jeff Sessions or Rosenstein until after the November midterm elections. Rosenstein is the day-to-day supervisor of the special counsel team. Remember, in the last few weeks there's been a flurry of activity - conviction of Paul Manafort in Virginia, a guilty plea by Paul Manafort, Trump's former campaign chairman, in D.C. with an agreement to cooperate, the sentencing of former campaign adviser George Papadopoulos. And the president's former lawyer Michael Cohen has been meeting with the special counsel too. So the timing of this report on Rod Rosenstein is weird. If he goes, it may not be enough to derail the whole Russia probe. Remember that the Justice Department has been doling out pieces of this investigation to the U.S. attorney in the Southern District of New York and elsewhere. So even if Rosenstein goes, this investigation may continue. SHAPIRO: NPR national Justice correspondent Carrie Johnson. Thank you.